This is a recipe i found on the net and tried and it is delicious. I am going to post regularly on age-well recipes because it is my favourite anti-aging site and i want to help build the community. 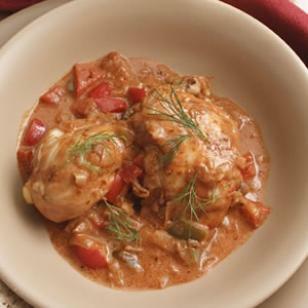 Sweet Hungarian paprika gives this creamy braised chicken the best flavor. This is a good “pantry dish” since you should have the basics on hand and only need to purchase the chicken. You may vary the recipe by using cubed veal shoulder instead of chicken and mushrooms instead of peppers. Serve with whole-wheat orzo flavored with minced parsley or dill. tomato paste, paprika and crushed red pepper. Add the chicken and stir it gently into the onion mixture. Sprinkle with marjoram and add broth. Cover the pot with a tight-fitting lid and simmer over medium-low heat until the chicken is very tender, about 50 minutes. When the chicken is done, remove it to a plate. Stir the sour cream mixture into the sauce; return to a simmer and cook, stirring, until the sauce coats the spoon. Reduce heat to low, return the chicken to the sauce and reheat, about 1 minute. Serve garnished with parsley, dill and/or chives, if desired. Make Ahead Tip: Prepare through Step 3, cool to room temperature and refrigerate for up to 1 day. Finish with Steps 4-5 before serving. Per serving: 331 calories; 14 g fat (4 g sat, 5 g mono); 116 mg cholesterol; 17 g carbohydrates; 35 g protein; 4 g fiber; 384 mg sodium; 705 mg potassium. Nutrition Bonus: Vitamin C (90% daily value), Vitamin A (50% dv), Potassium (17% dv). This Recipes is from EatingWell: I downloaded it couple of years ago and made it about once a month since. My family love it. I think age-well and eatingwell should partner - that would be awesome.